No one wants to think about bugs living on (or in) their pets. However, parasites are a common problem that can greatly affect a pet’s quality of life. Some parasites are inconvenient or gross. Others may be life-threatening. And some are even transmissible to humans. Here is a list of some common parasites that you should be aware of. Fleas are one of the most common parasites that pet owners have to deal with. What starts out as a little itching for the pet can result in a complete infestation of the home. Fleas feed on blood. They have four life stages – egg, larva, pupa, and adult – and some of these stages can be very difficult to eradicate from your home environment. If you see adult fleas on your pets, there is a good possibility that there are a lot more fleas in your home, many in different life stages that are harder to see. A female flea will start to lay eggs within 48 hours of her first blood meal, and she can lay up to 2,000 eggs throughout her 2-3 month lifespan. That’s a lot of fleas. There are two parts to flea control – your pet, and their environment. You can spray your home or yard with products available at your local hardware or pet store. However, you must also treat your pet in order to fully resolve the problem. There are a large variety of flea control products for both cats and dogs. There are topicals that enter the blood stream through absorption, and topicals that stay within the oil layer within your pet’s coat. Some topicals are combined flea and tick medication, and some also control heartworm. There are injectable, long-acting options for flea control, and there are oral medications for combined flea and tick control. This can all be a bit overwhelming. We would love to discuss it with you in person and help you make the right choice for you and your pets. Ticks are especially dangerous. In addition to feeding on blood, they also transmit a very wide range of diseases that can be very serious. Some of the major canine tick-borne diseases include Ehrlichia, Rocky Mountain Spotted Fever, Anaplasmosis, Lyme Disease, and Hepatozoon. In northern Oklahoma, Ehrlichia is the most common tick-borne illness in dogs. This infection causes the dog’s immune system to attack its own red blood cells. If not treated early in the disease, it may become chronic and lead to other problems including arthritis, increased bleeding, uveitis, and general lethargy. In cats, Cytauxzoon (sy-toh-zo-an) is the greatest risk in this area. It is a disease commonly carried by bobcats and can be spread to domestic cats through a common tick. Over 98% of cases are fatal to the cat with no known cure. There are a variety of products to control ticks, including topicals, oral medications, and collars. Many are paired with flea medication as well. If your pet is outside in an area that has ticks, maybe tick prevention is something that you should consider for the health of your pet. Ear mites commonly affect cats but may also infect dogs. They are contagious and can be easily passed from one animal to another. Cats may infect dogs, and vice-versa. These mites cause a lot of debris to build up in the ears (ear mite poop!) that can lead to ear infections and other more severe issues. In addition, they are very uncomfortable to the animal. They are irritating to the ear canals and they are ITCHY. Here is a video of ear mites in a cat’s ear as seen with an otoscope. It isn’t hard to imagine why these are so uncomfortable for the animal. Fortunately, ear mites are fairly easy to treat and prevent with the right products. If your pet has itchy ears, please give us a call and we can help determine if ear mites are the cause of the discomfort. There are many types of parasites that can live within the intestinal tract of your pet. They can cause a variety of problems including anemia, vomiting, and diarrhea. In addition, may of them are contagious to other pets and sometimes humans. Intestinal worms include roundworms, whipworms, hookworms, and tapeworms. Each of these types of worms can cause problems for your pet, especially in puppies. These worms may sometimes be visible in the feces or vomit of your pet. The eggs of these worms enter the environment of your backyard through feces and can pose an infection risk to other dogs or cats. In addition, some of these worms can cause conditions in children. If you have kids, it is very important to keep your yard clean and your pets healthy and parasite-free. In addition to worms, there are several microscopic organisms that can cause severe diarrhea in pets. These include cryptosporidium, coccidia, and giardia. These organisms are highly contagious from animal to animal. 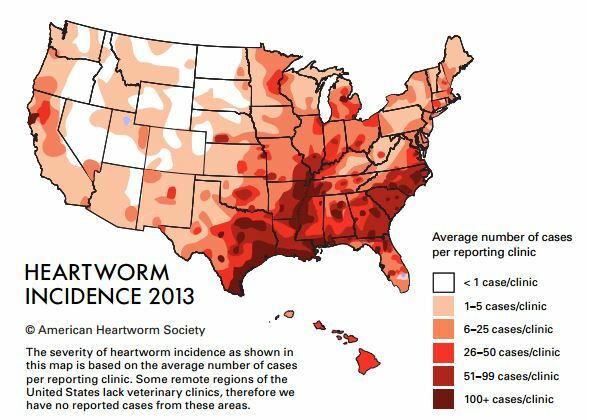 Heartworms are very common throughout the Central and Southern US. The worm is transmitted by mosquitoes as a microfilaria (kind of like a tiny worm). When a mosquito feeds on an infected animal – generally a fox, wolf, coyote, or domestic dog – it picks up the organism from the infected animal’s blood. The mosquito then feeds on your pet dog or cat and injects the organism into your pet’s bloodstream. The organism them matures over the course of 6 months and eventually ends up in your pet’s heart, where it will live for the 3-6 years. In cats, the worm burden is usually very low but they are severely affected. In dogs, there can be many worms present. Some of the common signs of infection include coughing, fatigue, lethargy, weight loss, and decreased appetite. If the infection becomes severe enough, the animal will go into heart failure and develop fluid in the abdomen. If the worm burden is especially high, a worm or a piece of worm may dislodge and fully block a blood vessel, causing cardiovascular collapse. Testing for infection with heartworms is a simple blood test that takes about ten minutes to run. The treatment for heartworm disease involves two injections a month apart. This is accompanied by strict exercise restrictions. There is still some risk involved with treatment that depends on the severity of the infection. Monthly prevention is available for heartworm disease – this prevents your animal from ever becoming infected. It is available as a topical or an oral medication. It is a simple solution to a very severe disease, which is why we encourage all owners to keep their pets on prevention year-round. Heartworm is becoming more and more prevalent in Oklahoma as time goes on and the climate changes. For more information about heartworm disease and prevention, please visit the American Heartworm Society’s webpage.